For the toward is a performance of graceful athleticism deconstructed into raw energy. It is an expression of relentless, human physicality straining against crushing weight. Two performers coax, ride, and hurl steel sculptures together to create a bearable environment in which to balance rest and labor. For the toward has undergone multiple transformations and revelations since its inception in 2014. It has been presented nationally, from proscenium stages to asphalt lots in the Midwest, always responding to and morphing according to site and circumstance. 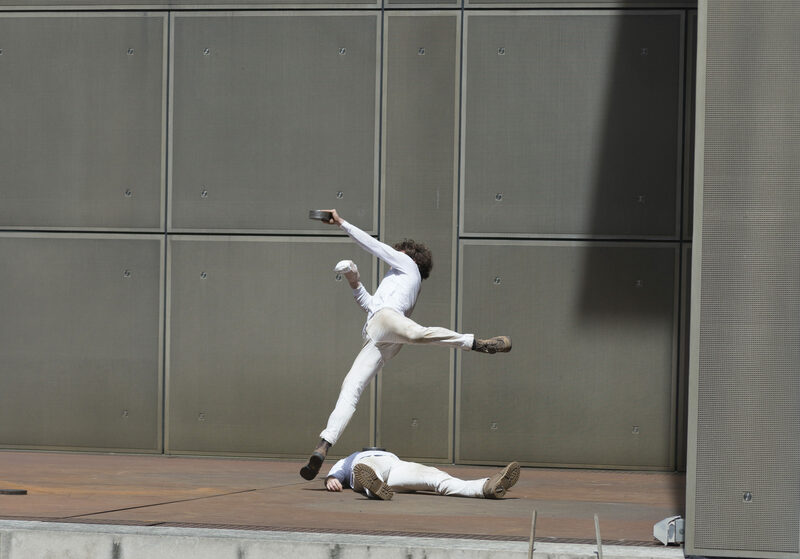 Most recently, For the toward was presented at the Museum of Contemporary Art Chicago, as part of the traveling Merce Cunningham retrospective exhibition Common Time, where it was performed upon steel-surface plinths elevated 20 feet above the ground. For the toward has also been presented at Pulse Art Fair in Miami, and was curated by SiTE:LAB to participate in ArtPrize7, where it shortlisted as 1 of 20 juried finalists for the Grand Jury Prize. This presentation at Pioneer Works—upon the staggering weight of imported solid steel road plates—marks For the toward’s New York City premiere.